I used to be one of those dopey people who divided the world between Ella Fitzgerald and Sarah Vaughan lovers. Foolishly, I admired Ella Fitzgerald’s technical skill preferring Vaughan’s humor and spontaneity with a crowd. The sheer perfection of Fitzgerald’s singing always kept me at a respectful distance, but Ella in Rome erased all of that. Three things are immediately clear upon hearing her perform live, her effervescence, her humor, and her out of this world singing chops. This concert date might not have stood out for the band but there were a few things about it that made it special. Besides being backed by her regular rhythm section, with pianist Lou Levy, bassist Max Bennett, and drummer Gus Johnson, she also had her pal Oscar Petersen and his trio rounding out the bill. Another notable thing bout this concert is that it was recorded live in stereo, a new process at the time. Calling the recording lost isn’t quite accurate as it was just forgotten as the Rome stop was just one more stop in a huge tour. In 1988 when the recording was discovered filed away in producer Norman Granz’s archives. When it was released it immediately went to the top of the jazz recording charts. There so many technical was to describe what this recording captures but none of them conveys the sheer joy and enthusiasm of the performer and the crowd. Instead of going through the song list I will note a few moments of magic that put you right in the hall. Introduced by producer Norman Granz in his amusingly unmusical, halting Italian Fitzgerald swings into “Saint Louis Woman” and when she begins scatting half way through the tune the crowd goes wild, as she scats the last section of the song they erupt again and this is just the first number. Some of the other highlights include “Caravan,” “It’s All Right with Me,” and “I Can’t Give You Anything But Love,” during which she imitates both Louis Armstrong and Rose Murphy. My favorite number comes at the end of the recording when Fitzgerald performs “Stompin’ at the Savoy” with the Oscar Peterson Trio. Peterson, a notorious jokester, begins the song then Ella joins the slower swing tempo but soon you can hear something is up. You might assume that it is Oscar Peterson’s humming that’s the problem but, Peterson was known to hum along as he played both live and in recordings. Truth is, it’s almost impossible to know what he is doing but at one point Fitzgerald can’t go on singing and starts laughing, she then regains control improvising replacing the lyric, “Dancing with you” with “Oscar, we’re through” as the song swings to a sublime toe-tapping finish. 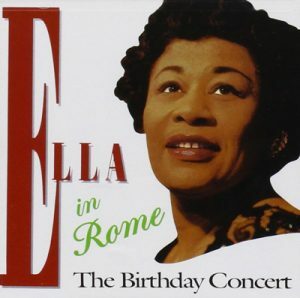 Ella in Rome – The Birthday Concert, get it and then listen to Fitzgerald’s other work. You might find a new appreciation for a great artist as one heck of a fine live performer.